This video is part of the appearance, “Cisco DNA Spaces Presents at Tech Field Day Extra at Cisco Live Europe 2019“. 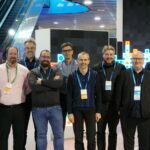 It was recorded as part of Tech Field Day Extra at Cisco Live Europe 2019 at 15:30 - 16:15 on January 28, 2019. This session with introduce Cisco new location platform, Cisco DNA Spaces. We will demonstrate and discuss how Cisco is offering customers the ability to migrate their workloads to the cloud and will show how new cloud services and applications can assist with on premises or cloud offerings.